If you're not leaking anywhere-and is sinking to the floor-replace the master cylinder,its not coming from the booster. I have thoroughly checked for leaks (thinking that was the problem). I will replace the master cyl and start from there. I do have a question about bleeding the brakes on this truck. Should I try bleeding the brakes with the power on or with the truck running? You can follow this guide explains is perfectly. I ordered a new master cylinder from Autozone (they were the only ones that could get it for me the same day). I received it at 5:30 pm Sunday night. After I bench bled the new master cylinder per the new manufacturer instructions, I installed the MC. I bled the brakes, and I have done many disc and drum brake jobs over the years for my family and I (and we are all still alive), and the same problem still exists. The brakes get hard when we are sitting there bleeding them, but once I start the engine, they go straight down to the floor I have checked thoroughly for leaks and have not found any. Since I have replaced the master cylinder (MC), it seems like the only choice left is the power booster. Yet, a problem like this sure seems like there is air somewhere in the lines. It seems like there is a possibility that there is some sort of leak that I am not able to detect. I am thinking that my next move is to take it to a brake shop and get the system vacuum bled. What are your thoughts with my problem? You may need a scanner to open the valve in the ABS while bleeding I have seen this problem before. You were right I took the truck to the shop and they had to used their scanner to open the valve to get the air out, All fixed thanks again for you help. When applying the brakes on a slippery road there is what sounds like a grinding noise. I have checked the pads and there is lots of meat left on them. Lately I have been able to push the brake pedal all the way to floor. There are no leaks and the resevoir is full of fluid. Originally I thought there was something wrong with the ABS, but now I am thinking it may be the master cylinder or maybe two separate problems. The master cylinder may be by-passing internally this will give a low sinking pedal with out fluid loss, as for the noise I would be re checking all the pads just in case you have a faulty caliper that is causing one pad to wear faster than the other, start here. The parking brake light comes on and the service brakes message appears on console and the brake pedal goes all the way down to the floor. The truck brakes still work but the brake pedal has way too much travel now. The problem started when I had to apply the brakes quickly and that is when all the lights went on and the pedal went to the floor, it was scary when it happened! The brakes don't show any fluid leakage. 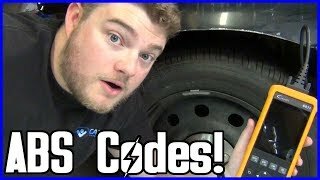 Go to Auto Zone or similar and see if they can pull a brake code that will help diagnose. Brake problems: Pedal to the floor right after starting with sometimes very hard pedal with no braking at all. New pads, rotors, master cylinder and booster, bled four big jugs of new fluid. 19" of vacuum at idle then fluctuates between 23" on rev down to 13" after throttle let off, cigar test could not find leaks. No error codes on PCM. The first thing I would do is isolate the problem by taking 4 vise grips and gently close off the rubber brake lines to see if the problem is caliper or system related. I changed out my brake pads and now my brake pedal goes to the floor. Front or rear brakes? Do the rear have the parking brake built into the calipers? Once you had the pistons reset into the calipers to make room for the new, thicker pads, you had to pump the brake pedal to run them back out until the pads contacted the rotors. At any time did you push the pedal more than half way to the floor? If you did, it's very likely the master cylinder was damaged. Crud and corrosion build up in the lower halves of the bores where the pistons don't normally travel. Pushing the brake pedal to the floor runs the rubber lip seals over that crud and can rip them. That will result in a low pedal or a slowly-sinking pedal. Those often don't show up for two or three days. 2000 Silverado 2WD 5.3L - no brakes - no loss of fluid - replaced master cylinder - bled with new fluid - still no brakes - all known fuses good (ABS 60A in fuse box under hood) - Now difficult to place in gear due to no brake pedal. Please help. Greg. Does rapid pumping of the pedal result in pedal pressure? Was this the reason for replacing the master cylinder? When bleeding the system, was there high pressure at the wheels? I put new calipers on the rear. Bled them with wife pumping the pedal. Could not get the pedal to come up off the floor. Put a new master cylinder on. Bled it on the bench and the pedal still goes to the floor. I have done this kind of work for forty years. What am I doing wrong? Okay, not saying your wife doesn't know what she is doing or anything haha, but are you sure she was pumping and actually holding the pedal and pushing all the way down while you cracked open the lines, and not pumping while you had the lines open? Maybe look into the brake hose(s) in the rear.